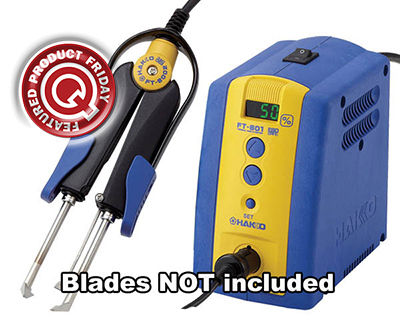 Save $26.97 off the MSRP on Hakko (FT801-02) FT-801 Thermal Wire Stripper (Q Source SKU: H001-002257) when you use our FPF080114 Coupon Code. This Featured Product Friday (FPF) promo is valid from today, August 1, 2014 through Sunday, August 3, 2014. The ESD-safe FT-801 Thermal Wire Stripper (MFG Part Number: FT801-02) is a compact station with an ergonomic handpiece, locking process control, password security, auto power OFF, sleep mode, and a blade removal tool. (Please note: Blades are not included with FT-801.) Regularly listed at $351.97, but with our FPF code savings you’ll get it for just $325.00. While this is a 3-day limited-time price, the coupon is unlimited. Use the code as many times as you like while it is valid—and please feel free to share the code with your friends & colleagues, too.